On Monday, Nov. 10, Muscovites reported smelling hydrogen sulfide in the air. Although a chemical emission was identified as the culprit, investigators have failed to identify the precise source of the pollution. A monitoring group of experts has been sent to the Moscow Oil Refinery in Kapotnya. 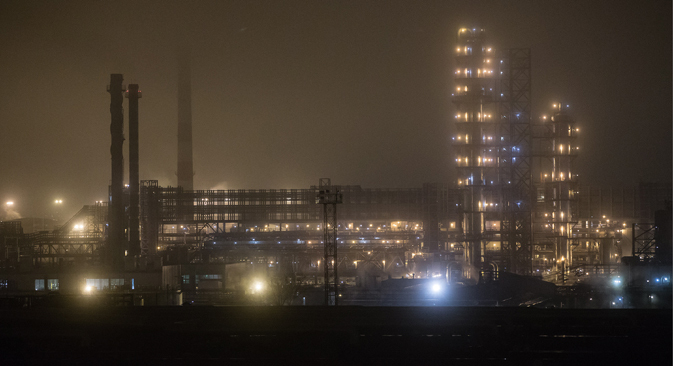 An investigation is underway into the activities of an oil refinery in Moscow after parts of the city were enveloped in a chemical vapor, causing alarm among residents. Inhabitants of central, eastern, and south-eastern Moscow complained about an unpleasant odor in the air on the morning of Nov. 10, with some recognizing it as the smell of hydrogen sulfide. According to state environmental monitoring agency for Moscow, Mosekomonitoring, environmental monitoring stations dedicated to studying the atmosphere in eastern and south-eastern Moscow detected heightened levels of hydrogen sulfide and styrene in the air. Quantities of these chemicals were above permissible levels in the Lyublino, Izmailovo, and Kosino-Ukhtomsky districts. During the measuring process, environmental experts established that not only hydrogen sulfide levels, but also styrene levels, were above average in certain areas on Nov. 10. The level of toxic styrene in Moscow’s Kozhukhovo district was 2.5 times the permissible level. Weather forecasters who analyzed the data collected on the toxins and the wind direction were able to localize the source of the toxic chemicals – the area surrounding the Moscow Oil Refinery in Kapotnya, said Yury Varakin, director of the situation center at Russian state environmental monitoring agency Roshydromet. “Based on the data collected, the oil refinery is the putative source of the pollution,” the expert told Interfax. “If you trace it downwind, everything points to the oil refinery,” he added. According to Varakin, as of 10:00 a.m. on Nov. 8, Mosekomonitoring’s atmospheric pollution control systems were recording hydrogen sulfide levels that surpassed the maximum residue level (MRL) by 500-600 percent. Varakin noted that such levels will not affect human health. “At 4:00 p.m. on Monday, the hydrogen sulfide concentration was 3 MRL in the Central district and on the Garden Ring. By 6:00 p.m., the hydrogen sulfide concentration at all stations had fallen to 1 MRL. In other words, this speaks to a one-time emission in the Moscow Ring Road area,” he said. Gazprom Neft, which owns the Moscow Oil Refinery, denied reports that any accident had occurred at the facility. The Russian Emergency Situations Ministry is continuing to monitor the air around Moscow after receiving reports of hydrogen sulfide odors in several districts, the ministry said in a statement on its website. Emergency Situations Minister Vladimir Stepanov said that the city’s law enforcement forces are searching for those responsible for the unpleasant odor that pervaded the capital on Monday. Based on material published by Interfax, Lenta.ru, and the Emergency Situations Ministry.